Are you looking for a quick, weeknight dinner suggestion? Do you want a meal that is delicious and easy to put on the table after work? The answer is fajitas! Don't you just love to order fajitas when you eat out? 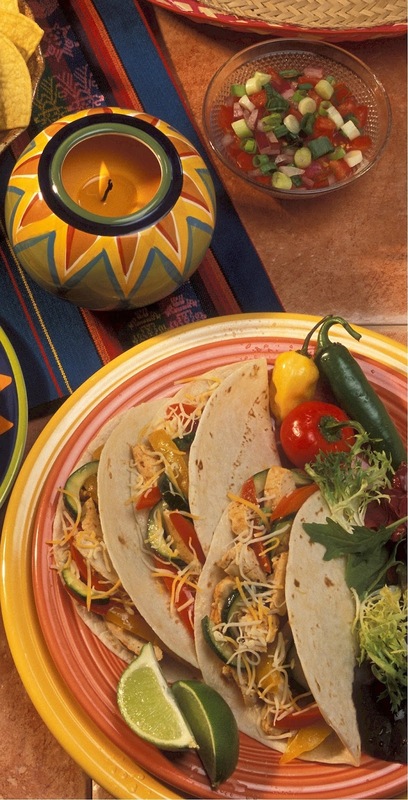 The warm flour tortillas, the sizzling vegetables, and the flavorful chicken or beef are delicious. You don't have to go out for yummy fajitas. You can make fajitas at home in no time flat. Yes, you can. Chicken fajitas are a favorite at my house. 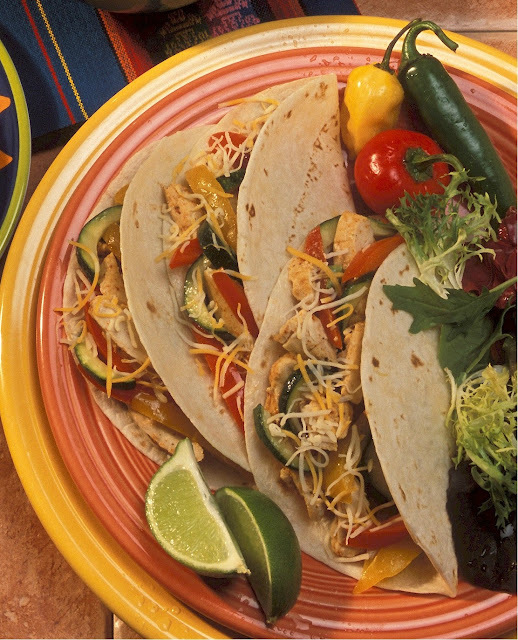 All this fajitas recipe takes is a little thinking ahead to make sure all the ingredients and toppings are on hand in the refrigerator or pantry. I marinate the chicken in a prepared dressing, cut up the vegetables and I am ready to go. As the weather starts to warm up here in the Northeast I find myself craving dinners that can be cooked on our outdoor grill. The outdoor grill is perfect for weeknight dinners like fajitas. Cooking fajitas on the grill is quick and easy and clean-up is a breeze! Another great thing about making chicken fajitas is that you can add the chicken and grilled vegetables to a green salad and enjoy a lower calorie and low carb version of this dinner while the rest of the family enjoys the fajitas. Often, that's what I do. This is a fun meal. Quick, easy, delicious and fun. What's better than that? Let's make fajitas for dinner, shall we? In a glass baking dish, pour Italian dressing over the chicken breasts to coat. Don't use too much, you just want to coat the chicken breasts with the dressing. Sprinkle the Southwest seasoning over both sides of the chicken breasts. Cover with plastic wrap and refrigerate. You can do this up to a day in advance. About 10 minutes before you are ready to cook, slice the onion, peppers, and zucchini into a bowl. I like to add zucchini to the mix to up the vegetable quotient and overall nutrition of this meal. Toss the vegetables with 2 tablespoons of Italian dressing and some fresh ground black pepper. Set aside. Preheat your grill. I use a gas grill, so all it takes is a push of a button to get things going. Place your vegetables in your vegetable grill basket, and cook them until softened and browned around the edges, but still crisp. Remove from the grill, cover and set aside. Next, cook your chicken breasts 3-5 minutes per side until cooked through. They should read 185 degrees F on an instant-read thermometer. Remove them from the grill onto a plate and cover with aluminum foil. Let the chicken rest for 5 minutes to absorb the juices, and then slice lengthwise into strips. Meanwhile, heat the tortillas, either in foil on the grill or in your microwave oven. That's all there is to it. Call the family to the table and everyone can make their own fajitas. Serve with a flavorful rice and a fresh garden salad and you have a festive and fun feast! Everyone will be happy, happy, happy! Thanks for commenting, Joyfully Mom. This recipe is perfect for busy families. This looks awesome! Love the veggies! You know, Stacy, I often add additional vegetables to my fajitas. Perhaps that means they aren't fajitas anymore, but who cares! Hi Dicia. I would love to hear how you like the recipe after you make it. Yum...I love fajitas! Thanks for the recipe! Thanks for visiting, Emma. Enjoy the fajitas. Chicken fajitas are a favorite here too - I hadn't thought of using zucchini though!! Great idea! Zucchini is a bit unusual, Liv, but I really like it in my fajitas. Give it a try.